I'M A COACH & EDUCATOR WITH LOFTY DREAMS. I BELIEVE LIFE IS TOO SHORT NOT TO DO WHAT YOU LOVE, EVERY SINGLE DAY! On the average day, you’ll find me coaching clients across the globe from my home office or in cute juice bars working from my MacBook. I've been running a business for over 10 years. I started out as a Personal Stylist & Confidence Coach. 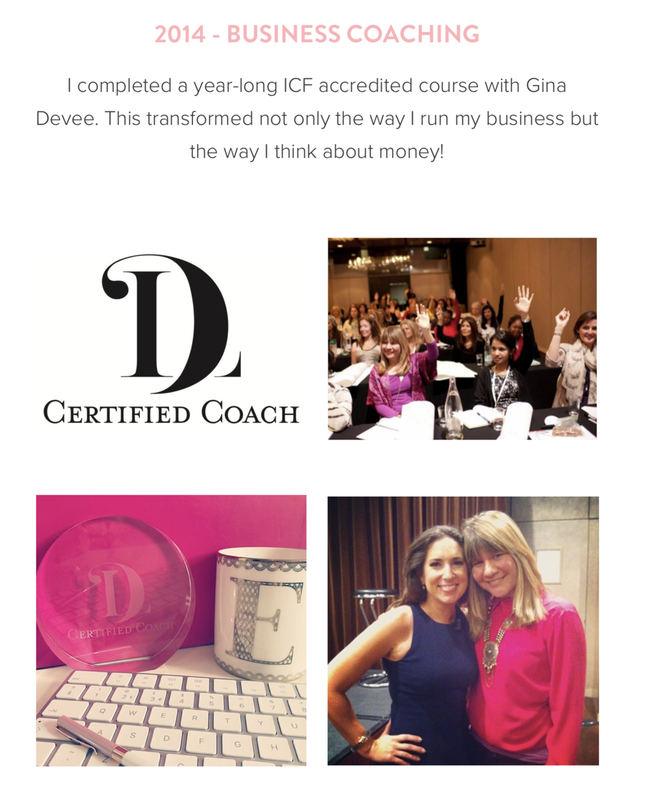 I now coach + mentor other female entrepreneurs, just like you, to attract ideal clients, get booked and quit YOUR 9-5 so YOU can get paid to do what YOU love. I haven't always been an entrepreneur. Far from it. I was a primary school teacher and whilst I loved being with the kids the job wasn’t for me because I got so ill I ended up in hospital and came out in a wheelchair. I was diagnosed with Chronic Fatigue Syndrome. Starting a business was a risk and a steep learning curve but after my job had literally taken the life and soul out of me, I knew it was time to make a radical change in my life. With nothing left to lose, I followed my love of style and helping others and trained to be a Personal Stylist and Confidence Coach. BUT I SOON FOUND THAT BEING GOOD AT WHAT YOU DO IS NOT ENOUGH TO CREATE + RUN A SUCCESSFUL BUSINESS! I didn’t have a clue what I was doing so I had to learn how to be an entrepreneur – the business strategies and mindset work involved in being a success. If you don't get your head in the game AND set up the right business structures, you'll end up working longer hours but getting paid less than your 9-5. After spending far too many years trying to figure it all out for myself, I hired the best business coaches in the industry (I'm talking 4 multi-millionnairesses!). I did the mindset work required to stride out of my comfort zone and consequently I've completely transformed my life through running my own dream business. I get to set my own working hours. I coach the most incredible women from across the globe. I really can travel the world and live the #laptoplifestyle. Every day I feel blessed to help support other women to believe in themselves and create a business and life better than their dreams too. Years ago, "Thank God it's Friday!" was my weekly anthem. I couldn't wait to get home each night and put on my pjs and pour myself a glass of something: my reward for making it through another day at work. Hardly the rock and roll lifestyle I'd dreamed of as a child. Let alone a 26 year old! Years before, I'd silenced that knowing-voice that told me I wanted something else and I fell into teaching. Don't get me wrong...I didn't HATE my job (I loved being with the children) but I hated what it was doing to me. I don't do things by halves so I really did give it everything I had. I'm not work-shy and got graded an outstanding teacher by 4 different Ofsted inspectors. But being good at something isn't reason to stay with it if it's not what truly excites you. It sucked the life and soul out of me. I was unfulfilled. But I didn't know any different. I was on autopilot making it though each week. I lived for the weekends and holidays - trying to salvage some of the depleted energy. I was spending most of my salary on trying to regain my health. THANKFULLY...Life had other plans for me. I got so ill I ended up in a hospital and came out in a wheelchair and was signed off work for 3 months. I knew I had to drastically change my life but I was terrified. Could I really do something else (meaning: start a business and still pay the bills)? Yet again, I chose to listen to my fears and returned to teaching as soon as I was physically able. LIFE STEPPED IN AGAIN...I got made redundant. And that's the time I finally started to ask myself what I REALLY wanted. I followed one of my passions and trained to be a Personal Stylist and started a business. That was back in 2008 and I've never looked back. I want you to know that everything you desire is not only possible for you but you deserve it. You have to follow that dream of yours. I'm not saying you'll get ill, like I did, if you don't but you'll always wonder 'what if'. And I know you're not the women to be happy with living a life of regrets. Through my free content and paid programs - I’m here to help you to not only see what’s possible but make it a reality for you too. If I can do this then so can you! There’s nothing special about me. I just had a dream and went for it and hired coaches and mentors along the way to speed up my results. Whether you’re just starting your business or looking to reach a larger audience and finally get paid the money you deserve, I’m here to help you. If you’re looking for support to get past your fears and limiting money mindset and to create business structures so you can attract dream clients while you're traveling the world (or even taking a nap), get in touch. Life is meant to be lived YOUR way. Oh, and best of all? You DON’T have to wait years (or even months) to start living your dream life! You simply have to take the first step. *Please note that by signing up to get this workbook, you will receive additional resources to help you build your business as well as promotional emails. The workbook is on its way to your inbox. STILL READING AND WANT TO KNOW MORE? I spent the first 4 years of my life in east Africa. I took drumming lessons at the age of 32 because I'd always wanted to learn. I've been gluten and dairy free for 20 years (I started the 'trend' *wink*). Aged 16, my English teacher told me I didn't have the intelligence to do A Levels. I believed her and left education for a year and worked in my parents' restaurant in Windsor. I then applied to college to do my A Levels and went on to university. I think that's why I was so passionate about being a teacher - I didn't want another child to get labelled in this way. I loved helping the children who struggled to believe in themselves and when they did they made so much more progress. Self-belief is everything.